Our kosher sea salt is guaranteed to be an unrefined salt that is contains 60+ trace minerals with no additives or anti-caking chemicals! More specifically, it’s a good source of magnesium, a fantastic and important co-factor to many enzymes that play an important role in energy production, blood sugar control, and nervous system and brain chemistry. Plus, this sea salt’s flecks of color like indicate beneficial amounts of iron. Comparatively, this pink sea salt is more mineral dense than regular salt, and as an added bonus, add it to any and all recipes to enhance flavor! Sodium chloride and 60+ essential minerals including magnesium and iron. Nutmeg, similar to cinnamon, is a brain tonic that stimulates your brain and improves concentration. Something to consider when pulling an all-nighter or preparing for an important work presentation! But, nutmeg’s benefits don’t stop there; many of the phytonutrients found in this autumnal spice are essential for optimal health. The plentiful amounts of antioxidant phytonutrients, as well as manganese and copper, make nutmeg a great liver and kidney detoxifier, while also providing healthy digestive, antibacterial, skin, anti-inflammatory, anti-depressant, and sleep aid support. So, it may just be your answer when facing finals week! We all get it, those common, undeniable stress symptoms – the bathroom dilemmas, the stomach cramps, the headaches, the loss of focus and sleep – well, thankfully, it seems that nutmeg helps ease all of these anxiety symptoms! Are you in? Fiber, manganese, copper, potassium, calcium, iron, zinc, magnesium, B-complex vitamins, vitamin C, vitamin A, and antioxidant flavonoids. Nutmeg is thought to be an aphrodisiac, sedative, and strong reliever of joint pain (apply nutmeg oil to affected areas of joint or muscle pain). In ancient Egypt, cumin was not only used as a culinary spice but also for mummification. Cinnamon is a rich, warm spice that often evokes warm feelings even in the cold winter months. Whether it's complementing a pumpkin recipe in the fall or a rich warm beverage in the winter, cinnamon is the perfect spice to add warmth to everyone's life. 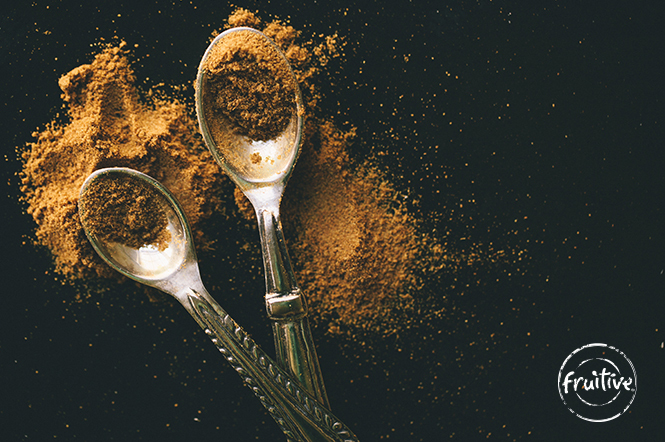 But that's not all - cinnamon also packs many unique health benefits. More specifically, cinnamon provides special cognitive benefits and may be the secret to your next study sesh! How you may ask? Well, by simply smelling it! One study found that chewing cinnamon flavored gum, or smelling cinnamon, enhances concentration. So, the next time you’re studying for a test, taking a final, or even preparing for an interview, pull out some cinnamon flavored gum, or add some extra cinnamon to your much needed ""just-pulled-an-all-nighter"" Indulgence, and ace it! Cinnamon is actually dried brown bark of the cinnamon tree. Cinnamon is also one of the oldest spices known. It dates back to being mentioned in one of the first botanical Chinese medicine books and was also used in ancient Egypt as a flavoring and embalming agent. Cardamom has so many health benefits it's hard to believe you don't find it in more recipes! Similar to ginger, cardamom helps fight off nausea, bloating, gas, heartburn, acid reflux, constipation, and many other digestive problems. It's also a strong kidney detoxifier, due to its diuretic properties, as it truly flushes and cleans out the urinary tract, bladder, and kidneys. Thus, it thoroughly removes toxins and combats infections too. Full of antioxidants, this anti-inflammatory agent, is an ingredient you definitely want on your side. aids in treatment for mouth ulcers, digestive support, may even help depression, combats free radicals and other toxins, freshens breath, diuretic properties that help flush out toxins, may help relieve cold and flu, anti-cancer properties, lowers blood pressure, blood clot aid, anti-inflammatory, and antimicrobial properties. Cardamom has anti-spasmodic properties, which means it may help get rid of hiccups without someone scaring you! Black pepper enhances flavor and adds a little kick to any recipe… but we’re sure you already knew that. However, we think we found some black pepper facts that you might not know; like, did you know that black peppercorns are actually half-ripe, sun-dried fruits of the pepper plant? More specifically, all peppercorns are made the same way, but their color varies based on the ripeness of the berry before it’s sun-dried. Also, did you know that black pepper actually stimulates your taste buds and increases hydrochloric acid secretion in the stomach, which ultimately improves digestion!?! Fascinating little spice, no? improves digestion, provides diaphoretic (sweat), diuretic (urination) & carminitive (prevents intestinal gas) properties, and is also shown to have anti-cancer, anti-inflammatory & other antioxidant benefits, as well as antibacterial properties. Since ancient Greece, pepper has held prestige as a seasoning, currency, and sacred offering. During the fall of ancient Rome, gold, silver, and pepper were demanded as ransom. During the Medieval Times, pepper often measured wealth. This deep red spice is definitely something to write home about! Paprika is rich in tons of nutrients and minerals, let’s take a look... First of all, it’s a great source of vitamin A and carotenoids – lutein, zeaxanthin, beta-cyptoxanthin, and beta-carotene – which provides tons of eye health benefits - woot, woot! Paprika is also a surprisingly good source of iron, vitamin B-6, vitamin C, vitamin K, vitamin E, riboflavin, niacin, and potassium - crazy for an ingredient that’s oftentimes overlooked. And what about the slight spiciness to this spice? We can thank capsaicin for the flavor and for some pretty neat health benefits. Specifically, capsaicin may actually help relax blood vessels and lower blood pressure. By weight - paprika has more vitamin C than an orange…but obviously it's easier to eat and drink more of an orange than paprika. Getting sick or already feeling sick? Or maybe you're just looking for a little spice in your life? Well look no further, cayenne pepper is your new best friend. Cayenne pepper provides many great immune boosting benefits, including the ability to fight headaches, ease congestion, and act as a lymph node cleanser. As you may already know, cayenne pepper can be a little spicy thanks to its high concentration of capsaicin. Capsaicin is the superhero that aids in weight loss, relieves pain, increases production of endorphins, provides cardiovascular benefits, prevents ulcers, and effectively clears nasal passages. In other words, cayenne is a spice pack-full of benefits - especially those related to relieving cold and flu symptoms. So the next time you’re feeling under the weather, shake some cayenne in some warm lemon water or even on some delicious, steamed veggies. Or take it a step further and order a Fruitive Cold Pressed Illuminade, Immunity, or Immunity Plus and feel better soon. Cayenne pepper was first introduced to the rest of the world after Christopher Columbus “discovered” it during his exploration of the Caribbean Islands. He saw the natives using it and brought it back to Europe to be used as a substitute seasoning for the once-expensive black pepper.